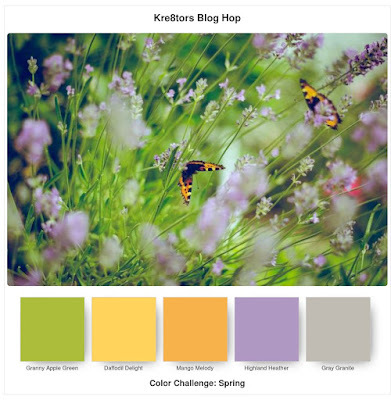 Welcome to the April Kre8tors Blog Hop! This months theme is a Spring Colors Challenge. And they are such pretty colors too. Granny Apple Green, Daffodil Delight, Mango Melody, Highland Heather and Gray Granite. I actually managed to use them all in my project. I had been wanting to try coloring the Country Floral DTIEF with my Stampin' Blends for awhile now and the color challenge gave me the excuse I needed to sit and color it. I am so happy this embossing folder carried over into the new annual catalog. I find myself reaching for it frequently. I started by cutting a 2 pieces of Whisper White Thick at 4" x 5 1/4". I spritzed each piece with a little alcohol, put it in the folder and ran it through the Big Shot. I colored all of the raised areas on one of the pieces with my Stampin blends. I added some Wink of Stella to the Gray Granite dots and then speckled the entire piece with Wink of Stella. I left the other piece as is. I have to admit to a mistake I made at this point. I had planned to use the current sketch over on the Sunday Stamps blog. This involved cutting the Colored piece into 3 equal sizes. I was using the Stitched Rectangle Framelits to do this. I got the first one cut just fine, but when I went to cut the second one I had turned the colored piece the wrong way.😲 WAH!😩 Messed that up good. But I have a stubborn streak a mile wide. I wound up with 1 long die cut and 2 short ones. I cut 2 small Stitched Rectangles from the un colored embossed piece. I added Dimensionals to the backs and adhered them to the Granny Apple Green Card Front. I cut a larger Stitched Rectangle from some Vellum and arranged the last colored piece on it, adhering it with Glue Dots. Then I added some more Glue Dots to the backside of the Vellum under the colored piece and adhered that to the Card Front too. 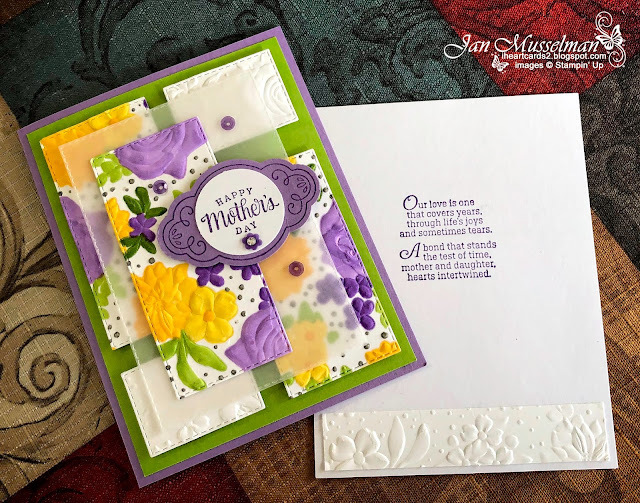 Finally I stamped the "Happy Mother's Day" with Highland Heather Ink onto a scrap of Whisper White and punched it out with my 1 1/4" Circle Punch. Using a stamp from the Label Me Pretty set I stamped a piece of Highland Heather cardstock with Highland Heather ink, and then punched it out with the Pretty Label Punch. I adhered the stamped Circle to the stamped Pretty Label with Liquid Glue. Added Dimensionals to the back right side of the Pretty Label, A Glue dot on the left side and adhered the assembled label to the Vellum. Wow, glad that's done🥴. The last thing I did was to add some Gingham Gala Adhesive Sequins and a Clear Rhinestone Basic Jewel as accents. Now it is time to see what Anastasia has chosen to share with you today.